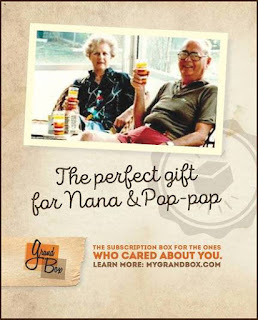 Being Frugal and Making It Work: Send Grandma & Grandpa a Subscription Box From GrandBox! Send Grandma & Grandpa a Subscription Box From GrandBox! GrandBox, the subscription box for the ones who cared about you. Order yours now! My readers get to save! Save on your first purchase! Use coupon code: FAMILYGUIDE5 to save $5 on your first GrandBox order!